This project has received funding from the Ministry of Science and Innovation, within the National Plan for Scientific Research, Development and Technological Innovation, Ref. : BSO2003-06992 (2003-2006); PET2008_0225 (2008-2011). Tradislexia is a video adventure game designed for Spanish-speaking children that takes into account principles derived from cognitive theory and multimedia learning. In Tradislexia, the player is required to unravel a mystery or situation about which little is known to complete the assigned quest. This game has a clear educational and remedial purpose in that it was designed to improve phonological processes and word recognition, based on 3D (Torque Game Engine; www.ocideidi.net). This game also trains the user in different cognitive processes associated with dyslexia: perceptual processes, phonological, orthographic, syntactic, semantic, and comprehension. 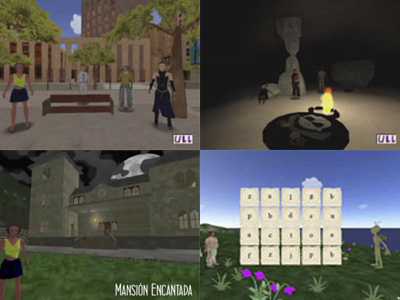 Training activities for each of these processes are presented in different scenarios as part of video game history. In the game the player takes an active role in activities to improve reading processes such as PA. The game goes through different scenarios (e.g., Boulevard, Old House, Desert Island, and Lunar Landscape). Each follows the same instructional sequence provided by an MA. The MA is the video game character that helps the player perform activities and provides the feedback (both positive reinforcement and corrective). The sequence has the following steps: a) the MA explains how to perform the exercise b) the MA does the exercise (as it is the first time and serves to model the correct way of doing it), c) the MA invites the player to do the same example, d) the player completes the exercise sample, e) once he or she has performed the exercise, the MA explains the right choice, regardless of the outcome, f) when the MA has finished explaining the task, it invites the user to perform the exercises, g) then the MA gives positive reinforcement if the user hits or says, “your retry failed,” giving a new opportunity to respond; h) finally, if a new user attempt succeeds, it gives positive reinforcement. But if he or she misses, the MA gives the correct alternative (corrective feedback). An example of instructional sequencing would be: 1) the MA explains and demonstrates how the exercise is done; 2) the MA waits for the child to repeat the exercise sample and provides feedback; 3) once the exercise is conducted, the MA shows the correct solution and gives the explanation; and 4) the child performs the exercises. The computer records the hits-errors and the number of attempts to complete the exercise correctly.